Beer Nerd Details: 7% ABV (on tap). 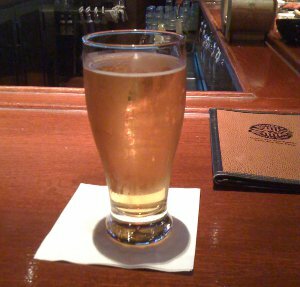 Drank out of a... whatever the heck you call the glass in the picture... on 8/9/11. 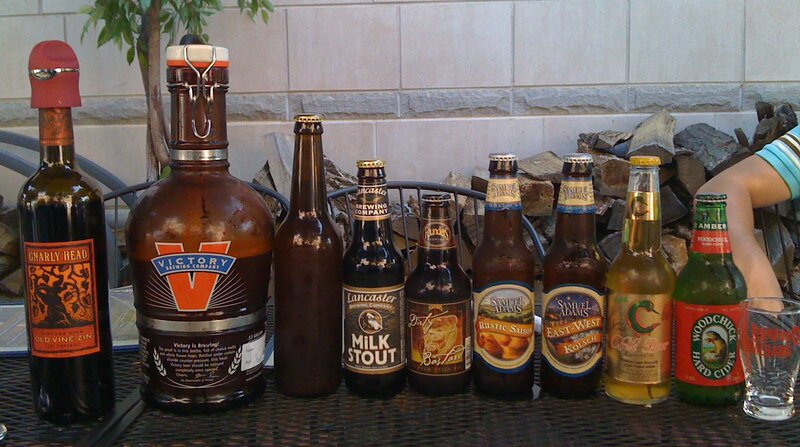 Victory Sunrise Weissbier - Hey, I've actually reviewed this before! A friend had been at the brewery lately, so they had picked up a growler of the stuff. It struck me as being somewhat better than the last time I had it, but I'll leave it at a B-. Solid hefeweizen style beer, but not particularly special either. 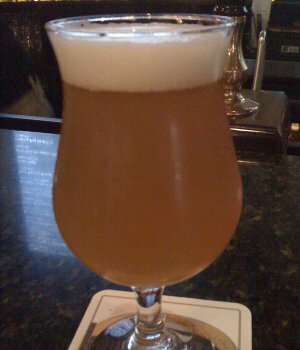 My Homebrewed Saison - I know I mentioned this last time, but this is definitely my best homebrew yet, and the first that I think is truly good. Sweet, spicy, well carbonated and easy to drink, it came out really well. Indeed, I'd probably give this a B+ or maybe even an A-. I should really review my other homebrews, which I'd probably rate much lower. Despite the fact that I'd had/reviewed half these beers before, I think it was another successful outing for the beer club. 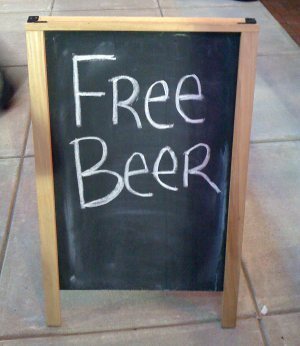 It's looking like we might get a bonus beer club meet at The Whip in addition to our normal meetup next month. Score! Yes, "research" into milk stouts continues. It occurs to me that I kinda rushed into the whole thing yesterday, so just to back up a bit, I want to talk about what actually constitutes a milk stout. Given that phrase, one might expect the rather disgusting addition of actual milk somewhere in the brewing process, but fortunately, that is not the case (though the lactose intolerant might still want to steer clear of these beers). Without getting into too much detail about how beer is brewed, I'll say that beer basically starts out as sugar water. Then you add yeast, which eats the sugar and converts it into alcohol, carbon dioxide, and various flavor compounds. Now, yeast typically doesn't eat all the sugar - typically it only consumes around 65-85%. This is why beer is still sweet enough that you need to add hops (which cuts the sweetness with bitterness). One of the implications of this process is that the more sugar you put into the process, the more alcohol you get. You also end up with a lot of residual sugars. This is why a lot of imperialized beers end up being really sweet. Beer Nerd Details: 5.3% ABV bottled (12 oz.) Drank out of a pint glass on 8/7/11. Quite enjoyable, and I think I could probably safely order the Northern Brewer kit. On the other hand, it might be worth checking in with the local homebrew shop and seeing if maybe he has some recommendations for me... Plus, it might be time to upgrade my equipment as well. Perhaps invest in some glass carboys, and so on. So I did some "research" last night. By which I mean, I went out and bought a bunch of beer and drank some of it. I'm trying to figure out what to homebrew next, and one of the candidates is a milk stout. Basically, I wanted to make a beer that was sweet and chocolately, with some roastiness thrown in and maybe some other complementary flavors (caramel!) Definitely not coffee, as that's one flavor I just can't get into. So looking around, there are a number of imperial stouts that might match my criteria, but I didn't want to go for a really high O.G. beer, so I kinda settled on Northern Brewer's Milk Chocolate Stout. It sounds pretty great, but I wanted to try out some milk stouts before I really committed to brewing a full batch of this stuff. Well, this is certainly not a beer that I'm looking to emulate, I can tell you that. Fortunately, I don't think the recipes I'm looking at are this bizarre. 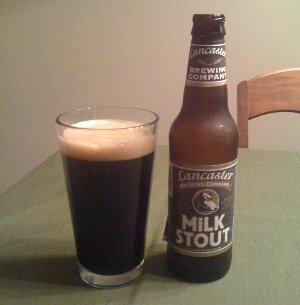 I had another milk stout this weekend that was much better though, so I think there's still hope. Hopefully that review will be up tomorrow. So I've already mentioned that Oskar Blues is famous for using cans, but what I want to know is when we're going to start seeing specialty cans. It's pretty common to see fancy special editions of bottled beers, using expensive looking foil or wrapping it in paper or pouring wax over the top, sealing in the goodness. So how long until we see different treatments for cans*? 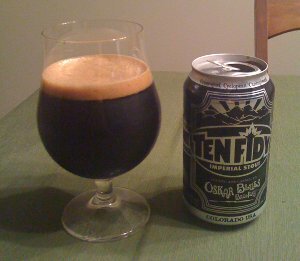 I did a quick spin around google looking at reviews for Ten Fidy, Oskar Blues' 10.5% ABV (get it? Ten FIDY! It's very hip.) imperial stout, and the general consensus seems to be that people are absolutely amazed that someone would put an imperial stout in a can. ZOMG! Lots of people mention the viscous, deep black, almost used-motor-oil appearance, which just makes me think that someday, we're going to see old-timey oil-can style packaging (complete with an independent spout that you have to jam into the can to open it) for a beer like this. There are tons of other creative cans that could be made as well. Of course, many of them negate some of the advantages of cans, but it would still be interesting. Well, that just about covers it. I have more details about these tucked away somewhere, but for now, this will have to do. Of course, this doesn't completely catch me up on reviews, but now the unwritten ones are from the past couple weeks, which is certainly more manageable. 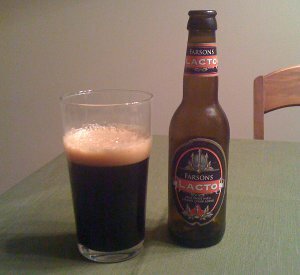 One of the frustrating things about reading beer blogs is that people often talk about rare or hard-to-find beers. This isn't really a slight against anyone - as I've grown in my beer nerdery, I've certainly been guilty of this from time to time, and it really is nice when you finally find a beer you've been looking for. So I'm used to seeing this from the beer bloggers out there, but when the brewery itself starts taunting you, well, that's a whole other story. When we made the Toronado's 20th Anniversary Ale, we had no idea that it would turn out to be one of our favorite barrel aged beers we would ever make. With that said, we have always wanted to make a dark barrel aged beer using 100% cabernet sauvignon barrels, but we never were inspired. 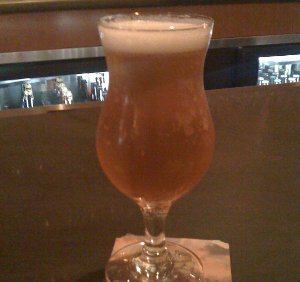 That is, until we blended five different beers to make the Tornado beer, the tobacco flavor from the dark malts blended nicely with the fruit character that developed in blending. So, with Consecration we set out to make a barrel aged beer using all Cabernet Sauvignon barrels. Now, we are not saying this is a replica of the T-rooms anniversary beer, after all, a beer like that can never be duplicated, and, there was no fruit added to that beer as there is with this one. All we are saying is that it gave us great inspiration to brew Consecration. Fortunately, Russian River knows what it's doing, so while I'll probably never get to try that Toronado beer, I do get to have some of the beer it inspired. Consecration is a wild ale brewed with Brettanomyces, then aged in Cabernet Sauvignon barrels with currants added. Sounds pretty spectacular, no? Beer Nerd Details: 10% ABV bottled (375 ml mini-magnum, caged and corked). Drank out of a goblet on 4/23/11*. 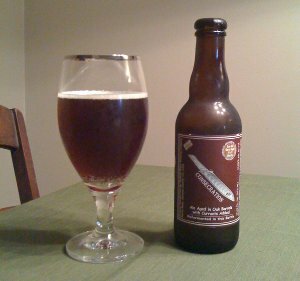 According to the label, this bottle was from batch 004X1, brewed on 3/29/2009 and bottled on 2/2/10. I think Brett beers are supposed to age reasonably well, but I have to wonder how this would have tasted if I got it fresh. In any case, sours still aren't my favorite style, but I'm beginning to come around a bit. 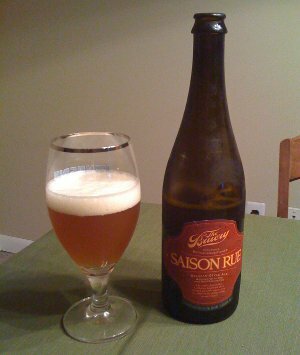 I have a bottle of Russian River's famed Supplication in my fridge right now... something I'm hoping to pop open in the near future. I'm expecting a little more out of that beer than the Consecration. * Yeah, I'm really, really behind on some of my reviews. Wanna fight about it? Expect some more old reviews in the near future as well. Scottish brewers Brewdog are no stranger to publicity. It seems they are almost always embroiled in one controversy or another. Right now, they're in hot water over a weird public dispute with CAMRA, a British beer advocacy group that campaigns for "real ale" or ale served from casks (their complicity in the issue is up to debate, but that's not a topic for this post - the linked aleheads article covers the situation well). But in the past, they've seemingly courted controversy with their high alcohol beers, engaging in a race to the highest alcohol beer in the world, which I believe still remains the 55% ABV End of History (and just to ensure publicity, they packaged the limited edition brew in a squirrel carcass). In response to all the kvetching about Tokyo*, Brewdog created a new beer called Nanny State, a 1.1% ABV brewed with massive amounts of hops. They called it an "imperial mild" and apparently it was so low in alcohol that it doesn't legally qualify as beer. Additional Nerd Details: I searched around a lot to figure out what the deal was with the asterisk in the title. I'm pretty sure it's just used to distinguish between the original batch and the newer, stronger batch, but then I noticed that my bottle is actually labeled "Tokio*" (with an "i" instead of a "y"). 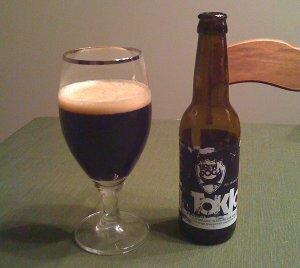 It's clearly the same beer as Tokyo* (it's certainly got the same ABV and the label is consistent with everything I know about the beer), but that at some point they must've changed the name to Tokio* (perhaps it was just a batch 007 thing). Searching around the interwebs, I see various explanations for both the asterisk and the "i", but nothing definitive. One explanation that seems plausible to me is the notion that naming your beer after an actual place (Tokyo, Japan) is illegal in some places and required the name change. Or something. Funnily enough, this marks the second time I can't really figure out what the heck is going on with a Brewdog beer name, the other being "Devine Rebel", for which I still can't figure out why Divine is spelled that way. Perhaps an email full of pedantic questions is warranted. So despite all their publicity stunts, I will continue to seek out and try more Brewdog beers, even the gimmicky ones. Indeed, I even have one of their Paradox stouts (a series of beers aged in various Scotch whiskey casks) sitting on my shelf right now. Beer Nerd Details: 6.5% ABV on tap. Drank out of a tulip glass on 7/23/11 (yeah, two days after the actual independence day - sue me).